History Of Egypt, Chaldæa, Syria, Babylonia, and Assyria is the masterwork of one of the fathers of modern egyptology. This work, in twelve volumes, was translated from the French original, “Histoire ancienne des peuples de l’Orient classique”. Maspero was a largely self-taught master of hieroglyphic translation. In November 1880, he was placed at the head of a French archeological mission, which developed later into the Institut Français d’Archéologie Orientale. Maspero then succeeded Mariette as director-general of excavations and of the antiquities of Egypt. 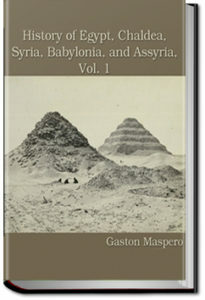 “Aware that his reputation was then more as a linguist than an archaeologist, Maspero’s first work in the post was to build on Mariette’s achievements at Saqqara. He expanded their scope from the early Old Kingdom to the later, with particular interest in tombs with long and complete hieroglyphic inscriptions that could help illustrate the development of the Egyptian language. Selecting five later Old Kingdom tombs, he was successful in that aim, finding over 4000 lines of hieroglyphics which were then sketched and photographed. “As an aspect of his attempt to curtail the rampant illegal export of Egyptian antiquities by tourists, collectors and agents for the major European and American museums, Maspero arrested the Abd al-Russul brothers from the notorious treasure-hunting village of Gorna, who confessed under torture to having found the great cache of royal mummies at Deir el-Bahri in July 1881. The cache was moved to Cairo as soon as possible to keep it safe from robbers. Maspero went on to sponsor and expand the system of national museums and presided over the growing collection of the Bulak Museum. Maspero gave a 17 year old Howard Carter his first Egyptological job – and it was he who recommended Carter to Lord Carnarvon. Carter and Carnarvon would go on to discover the tomb of King Tutankhaman.